Swiss painter, caricaturist and engraver. He trained as an engraver in Lausanne and while there illustrated Horace-Bndict de Saussure s Voyage dans les Alpes (Geneva, 1779) in 1786. He studied under Joseph-Benoit Suve in Paris (1789-91) and was influenced by Jean-Louis Demarne. On his return to Geneva Tpffer went on painting expeditions with Pierre-Louis De La Rive; these studies of the environs of the city inspired his best work. In 1796 he exhibited caricatures at the Salon in Geneva and from 1804 to 1807 was in Paris, where he was Drawing Master to Josephine Bonaparte. From 1810 he concentrated on painting such scenes from local village life as Open-air Sermon (c. 1810; Geneva, Muse Rath). 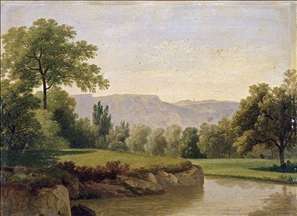 His anecdotal, animated landscapes were very popular not only in Switzerland but also in France, where he exhibited at the Salons of 1804 and 1812 in Paris. He won a gold medal at the latter Salon for the contemporary history painting Re-establishment of Religion in France after the Revolution (1811; Geneva, Muse d Art et d Histoire), a subject he had first treated in 1803 (versions, Geneva, Muse Rath; Lyon, Muse des Beaux-Arts). In 1816 he visited England, where he exhibited at the Royal Academy. Under the influence of English painting his work became more colourful, vigorous and economical. He also admired Hogarth s work and emulated his style in his own political caricatures (e.g. La Planche appartient a M. Frdric Raisin, 1817). On his return to Geneva in 1816 he began to produce such sparse, sober and balanced paintings as View of Mont Blanc (Geneva, Muse d Art et d Histoire). After a visit to Italy in 1824, he was inspired to do quick sketches of city life on the streets of Geneva. He was the most comprehensive recorder of the city and its surroundings of any 19th-century Genevese artist. 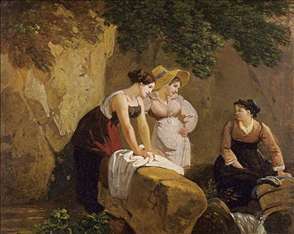 See more details about "Washerwomen in a Grotto"